Since each item is manufactured per order, you have the opportunity to choose your options from our extensive options list. Please contact us if you have any questions or requests, as we are here to take care of you. Chest : Keep measuring tape straight and level; do not pull tightly. Measure around the fullest part of the chest, under arms, and across shoulder blades. Custom Chef Coats made to order in as little as just 3 days*! 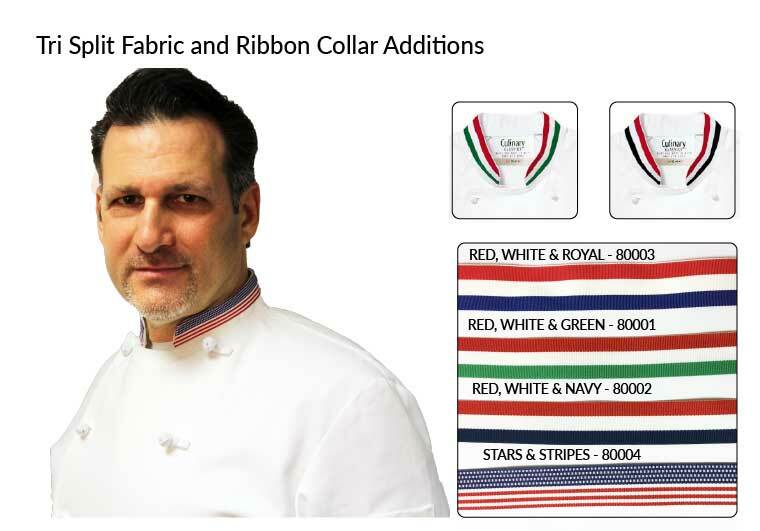 Custom Chef Coats, Chefs Jacket, Chef Pants, Waiter Shirts are all Made to Order in the USA. Choose from Top Styles, Durable Fabrics & Customization Options. Our Made to Order chef wear and server wear gives you the opportunity to create a unique uniform with options that make it your own. And, we offer not only quality products, but fast production times as well. Normal turnaround is 7-10 days, but if you need it sooner rather than later, you can order our custom products with a nominal Rush Charge*. Expedited shipping options are also available. Call Us at 877.378.4855 to talk with one of our exceptional customer service representatives for ideas, solutions and help in getting what you need, when you need it! We still offer quantity discounts, please call us at 877-378-4855 to discuss with our Design Consultants. When customers ask us for our best chef coat, we make sure to explain that each chef has their own best chef coat. It depends on what you need, it depends on what you like. 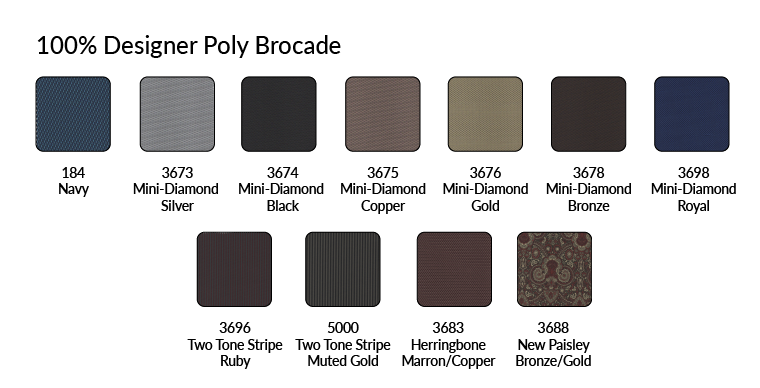 Here are descriptions of our fabrics, each with their own characteristics. If you'd like to get a swatch sent to you, or you have questions about what's right for you, just ask! Our most luxurious fabric, premium Egyptian Cotton has an incredibly soft feel. Lightweight and breathable, this 100% cotton fabric is truly a mark of elegance. Egyptian Cotton is available in black or white. Our 100% cotton fabrics are not pre-shrunk and will shrink up to 5% in the wash.
Our newest addition, An elegant but sturdy fabric pre-shrunk 3-5% with an added Elastane for a bit of comfort stretch. Made of 64% Poly/ 34% Cotton and 2% Elastane. Our Organic Cotton is 6.5 oz, USDA certified and available in many colors. Organic cotton is grown and processed without the use of pesticides and other chemicals that pollute the earth and our environment. Our 100% cotton fabrics are not pre-shrunk and will shrink up to 5% in the wash.
Our 100% Cotton Twill fabrics are soft, durable, and breathable to keep you cool in the kitchen. 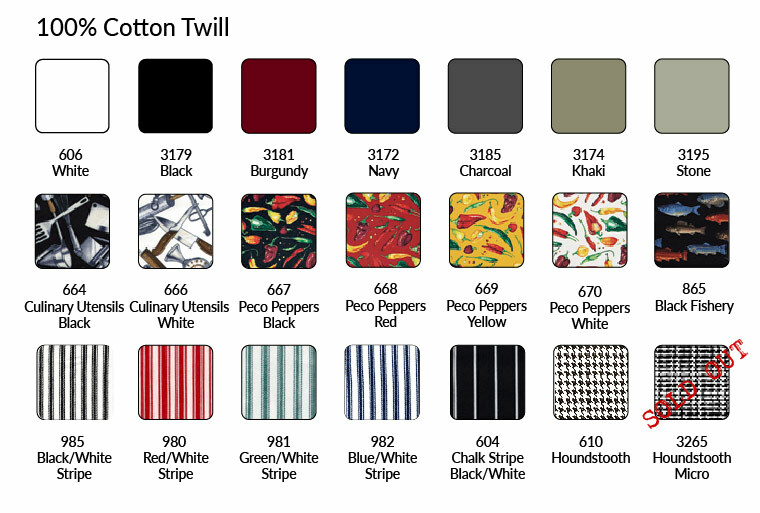 100% Cotton Twill is a great solution for pants, chef coats, aprons, and hats. If you'd like to have us send you a swatch, just ask! Our 100% cotton fabrics are not pre-shrunk and will shrink up to 5% in the wash. Lighter weight fabric than the 100% Cotton Twill, this fabric is great for hot kitchens and climates. Soft to the touch, Mid-Weight Cotton is cool and comfortable. Our 100% cotton fabrics are not pre-shrunk and will shrink up to 5% in the wash. Lighter weight fabric than the 100% Cotton Twill, this fabric is great for hot kitchens and climates. Soft to the touch, Mid-Weight Cotton is cool and comfortable. Our 100% cotton fabrics are not pre-shrunk and can shrink up to 5% in the wash. This 6.5 oz Twill is the perfect fabric for Chef Coats and comes in beautiful colors. 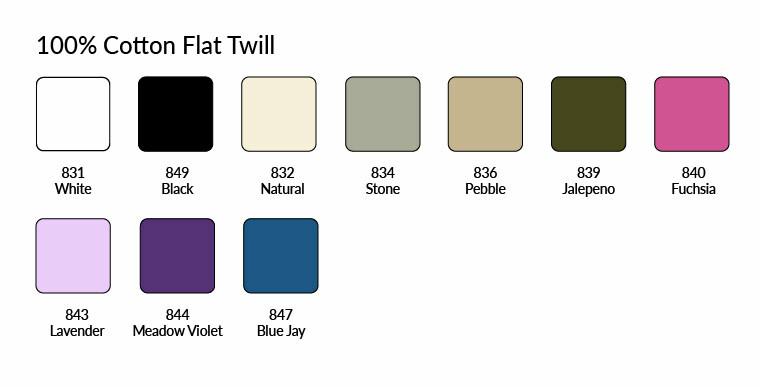 Also lighter in weight, our Fine-Line Twill is a smooth blend of 65% polyester and 35% cotton. The added polyester helps prevent some wrinkles and adds durability to the product. Our denim fabric is a great alternative for chef coats. Still 100% cotton, this fabric washes well and boasts the comfort and casual styling of denim while maintaining durability. Our 100% cotton fabrics are not pre-shrunk and will shrink up to 5% in the wash. Raw Indigo has not been washed and can bleed a small amount in the first few launderings. 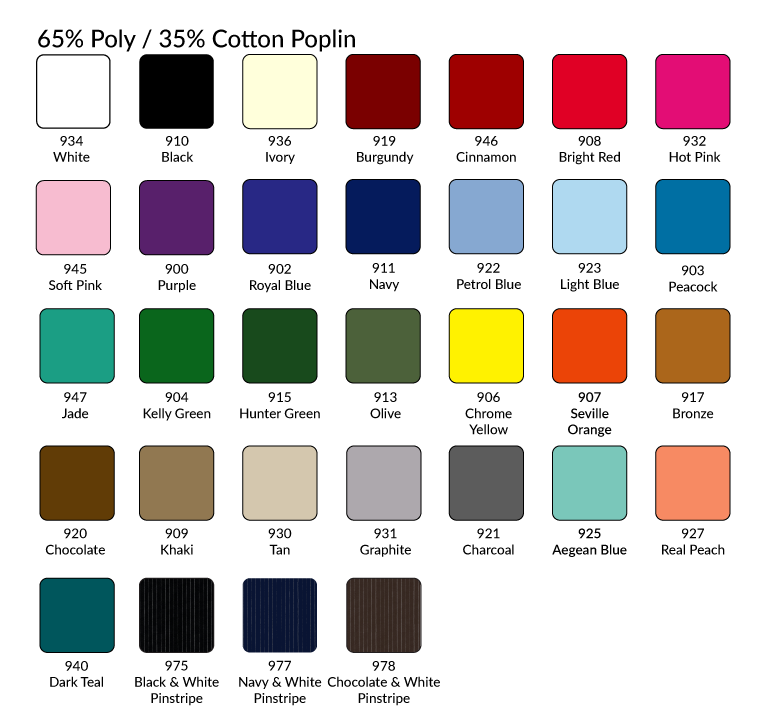 A low maintenance fabric, the Maxima Poplin washes easily, resists wrinkles and holds its color extremely well. Try this fabric for chef coats, aprons, pants and hats, as well as cuff and collar conversions. If you'd like to get a swatch sent to you, just ask! 65% Poly/ 35% Cotton. 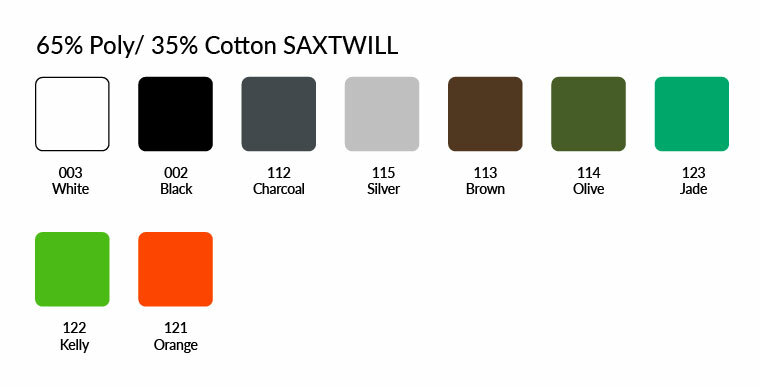 A different weave than our twill or fine line twill, the Saxtwill is a durable 7.5 oz. fabric that is excellent for aprons, hats and other applications. 65% Poly/ 35% Cotton. Our 10 oz Duck woven in 100% Organic Cotton is the perfect weight for aprons used in the kitchen. Beautiful crisp colors available. The Gray Camouflage is a 12 oz duck, perfect for heavier duty purposes. A different weave than our twill or fine line twill, our industrial blend offers a crisp look. With a 65% poly / 35% cotton blend, it helps make products low maintenance and durable. This 60 cotton / 40 poly blend is specially treated to help repel soil and stains. It provides the softness of cotton and the durability of polyester. A cotton / rayon blend feels smooth and silky to the touch. 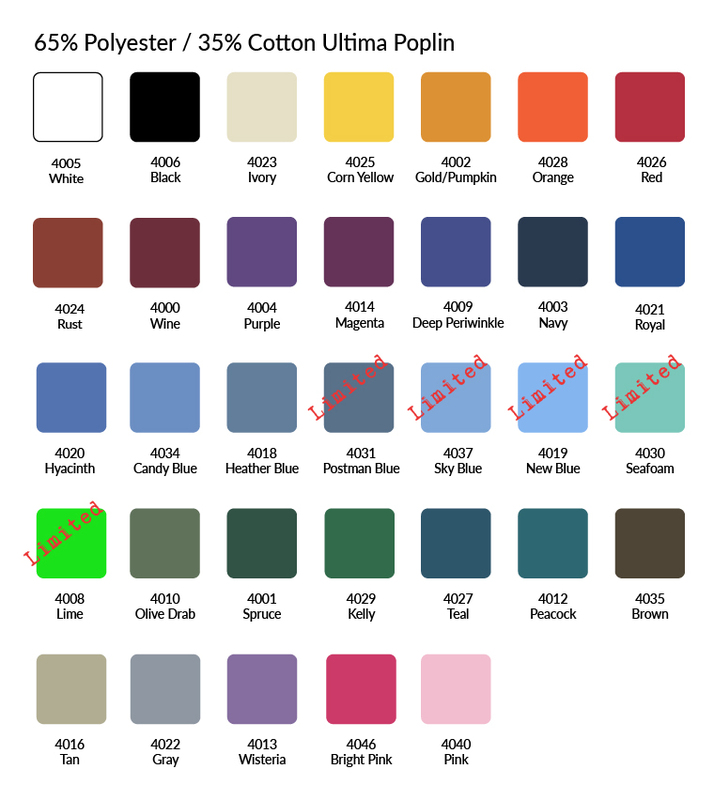 Try these fabrics for your next uniform involving shirts, hats, pants and ties. We would be happy to send swatches to you, just ask! Not only are these fabrics incredibly comfortable to wear, they are of a quality that far surpasses ordinary fabrics. We know that your uniform is going to get a lot of use, so why not make it durable and comfortable? These fabrics are great for shirts, vests, pants and ties. Our 100% cotton fabrics are not pre-shrunk and will shrink up to 5% in the wash.
A lighter weight poplin than our 900 series, the 4000 series is ideal for shirts, lightweight pants and ties. The 65 Poly / 35 Cotton blend means that wrinkles won't be easily set. Our spun poly is incredibly durable and wrinkle-resistant. Try it for industrial strength chef coats and aprons. We would be happy to send swatches to you, just ask! These fabrics have the pattern or repeat are woven into the fabric, and not printed so that the pattern lasts longer, making your staff look great longer. These textiles are perfect for pants, aprons, and shirts. 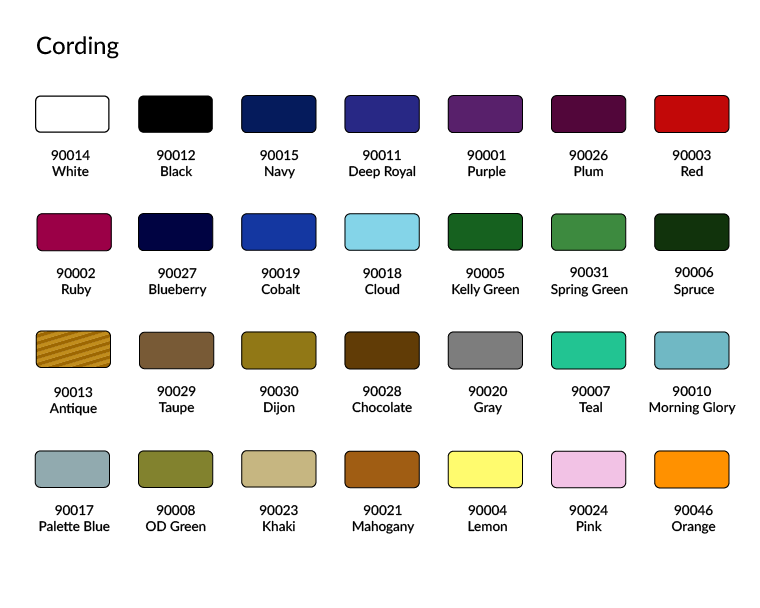 Please call us for more color options and free swatches! There are innumerable ways to tailor your uniform to fit your specific needs. Maybe you'd like a specific button, or cording on a specific location. Perhaps you would prefer 3-quarter length sleeves or a convenient breast pocket. Don't forget, we are making your order just for you. Go ahead, create exactly the uniform you want to wear. These button choices are for our chef coats. If you have any questions about this selection, or if you would like to discuss button options on shirts, please give us a call. Flat Plastic Buttons - These classic plastic buttons are available in white, black, gold, coral, red, royal blue, aqua, purple, garnet, pearl, chocolate, midnight, light blue, khaki, and kelly green. * Knots - These classic knot buttons are available in white and black. * Hand-Crafted Buttons - A great option for customers who would like their buttons to be a certain color, these buttons are flat, fabric covered buttons and will not get damaged when pressed. * Hand-Rolled Cloth Buttons - Our most elegant button, each is a traditional hand rolled cloth button made out of the fabric of your choice. 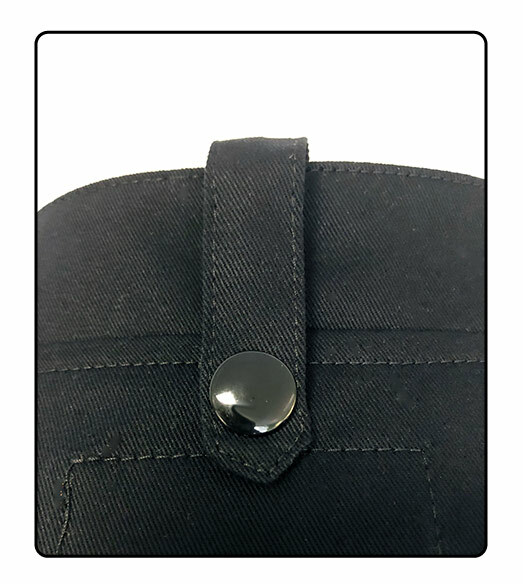 * Removable Stud - Removable plastic stud buttons are available in: white, black, red, royal blue, kelly green, spruce green, navy, pearl, and gold. * Removable Button Strips - These button strips allow cloth-covered hand-rolled buttons to be removed so that they will not be crushed when being professionally pressed. You choose the fabric of the hand-rolled buttons. * Copper Closures - Try these copper closures for denim coats as well as coats of other fabrics. * Placket - Nearly all of our shirts can have a placket to cover the buttons. This is a great option for fine dining or more formal establishments. Since we are manufacturing your coats just for you, it's not a problem for us to customize your cuffs and collars specifically to your liking. All of these options have an additional charge, but they are all well worth it. Add an apron tab to the back of your collar to help hold your apron neckstrap in place and relieve neck fatigue. Made with a nickel or gunmetal snap for easy access. Add cording to the collar, cuff, or front on almost any of our coats. 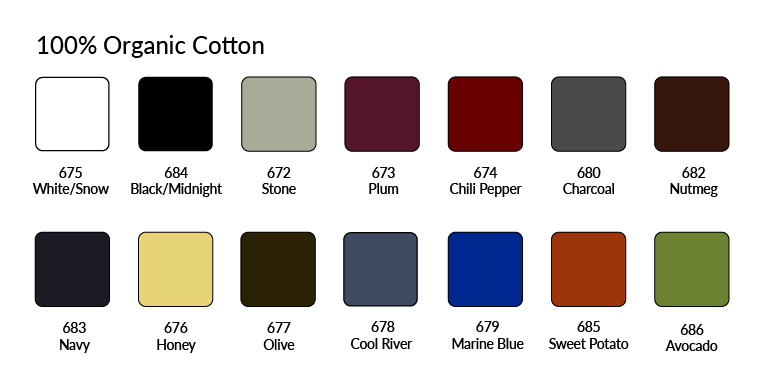 Below is a selection of colors to choose from! 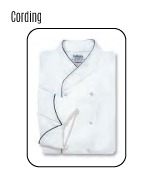 * Cording - Cording can be added to chef coats as well as aprons. 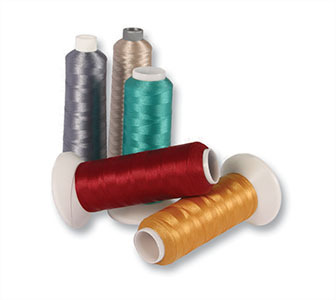 We offer poly / cotton blend cording as well as spun poly. Coordinated with an embroidered logo or added as an element of contrast, cording creates a beautiful finish. Add a collar conversion (contrasting fabric/color/pattern) to either a chef coat or a shirt. Call us and we would be happy to discuss fabric options and uniform design ideas with you. Choose almost any of our fabrics for your collar conversion. Solid or patterned, a collar conversion can be a great detail to add to your coat. Personalize your chef coat or shirt by changing the fabric of the collar and cuffs, We'd be happy to help you find the best fabric for this, just give us a call. We can embroider whatever you would like. 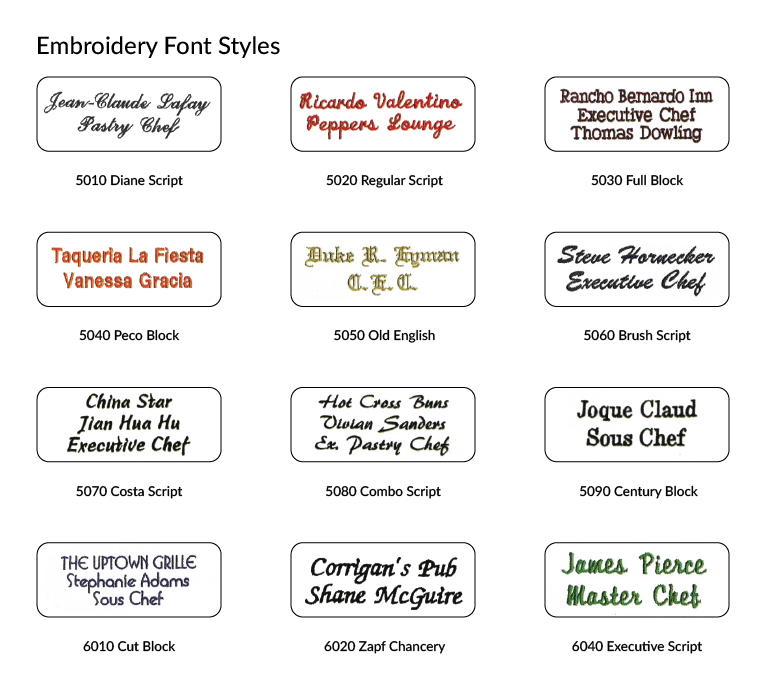 Please see the embroidery section for more information, and call us for specifics. You can choose any three of our Maxima poplin fabrics to create a striped look on your collar. Since we are manufacturing your coats order just for you, it's not a problem for us to customize your sleeves or add pockets to products. These options focus on chef coats. Please call us for shirt options as they vary per shirt. All of these options have an additional charge, but they are all well worth it. * 3/4 Length Sleeves - Instead of rolling your chef coat sleeves, try requesting a 3/4 length sleeve. You can also specify with or without a cuff. * Trim Sleeves - If you would prefer sleeves that are narrower at the wrist, try our trim sleeves on your next chef coat. *Short Sleeves - Any of our chef coats can be made with short sleeves upon your request. This is a great option for warm working conditions. * Plain Breast Pocket - Add a patch breast pocket to either side of your chef coat. * Corded Breast Pocket - Trimmed with your choice of cording, this patch breast pocket can be added to either side of your chef coat. * Concealed Breast Pocket - Add a concealed breast pocket to either side of your premium chef coat. * Corded Concealed Breast Pocket - You choose the color cording that trims this concealed breast pocket, available on either side of your chef coat. 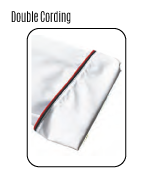 * Sleeve Pockets - Perfect for thermometers and pens, our sleeve pockets can be the same or contrasting fabric as your chef coat, and with or without cording. Available on right or left side. * Cell Phone Pocket - We can put a cell phone pocket on either side of your pants, provided there isn't a cargo pocket there as well. * Cargo Pockets - The Cargo Pant does come with two cargo pockets, but we can also put two cargo pockets on any of our other styles of pants. * Embroidery - We are incredibly proud of our embroidery services. Highly skilled experts and state-of-the-art machinery work to offer you a full range of possibilities. Basically, if you can think of it, we can embroider it - from logos and names to design elements. While we do have a one time $60 set-up fee per logo for digitizing logos, once we have your logo on file we can use it on any future product you order. Logos can be emailed, uploaded with your order, or mailed to us and we can start digitizing right away. We guarantee you'll be more than satisfied with the results. Please add this PRODUCT to your cart if we do not already have your logo on file. 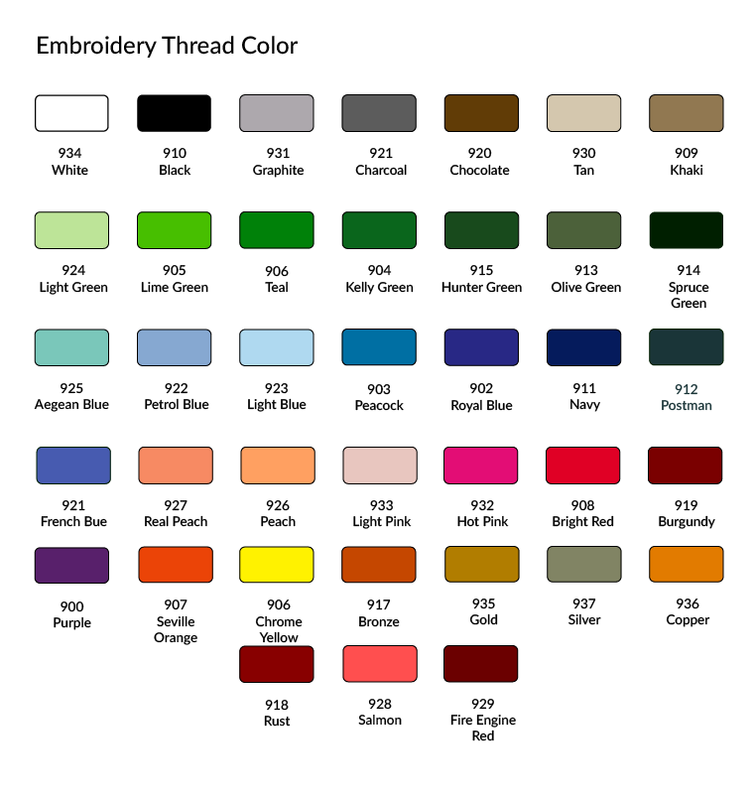 Embroidery options selected will be added to the quantities and sizes for the item selected. If you would like to order multiple sizes or quantities with different embroidery options, please add each selection to your shopping cart individually. Enter your desired lines of text for embroidery on a garment. Please consider the case sensitivity of the text you enter as the garment's embroidery will reflect the case of the text entered and your spelling . Select the font for the text, location of embroidery on the garment, and the thread color of the embroidery from the selections. Design Consultants are just a call away!